I’m not quite 64, for those who picked up on the song lyric reference within the post title, but I have just recently aged another year and now enter my 42nd year. 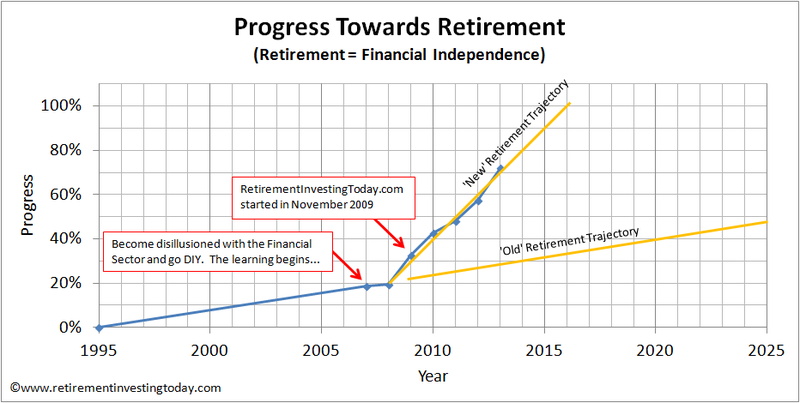 This requires two adjustments to my portfolio, as defined by the Retirement Investing Today Low Charge Strategy, which was first published in December 2009 and later refined in September 2012. Back in 2007 after plenty of research I set myself an income that I wanted in early retirement. That number is greater than I need to live and leaves room for some enjoyment given I could be in retirement for a longer period than I have already been alive. This became my Planned Income. From this I could then calculate the amount of wealth I had to acquire through Saving Hard and Investing Wisely by taking this number and dividing it by my Safe Withdrawal Rate (SWR). With the Low Charge Strategy defined which includes my savings rate, asset allocations and predicted returns from those asset allocations, plus armed with a Planned Income and SWR I was able to build an Excel model that predicts my retirement date based on the future being “average”. I prefer to think in today’s money, rather than devalued by inflation future money, and so all of the calculations are based in Real (ie inflation adjusted) terms. Obviously, we live in an inflation based society and so every year I need to increase that 2007 income by a cost of living adjustment to account for inflation over the past year. 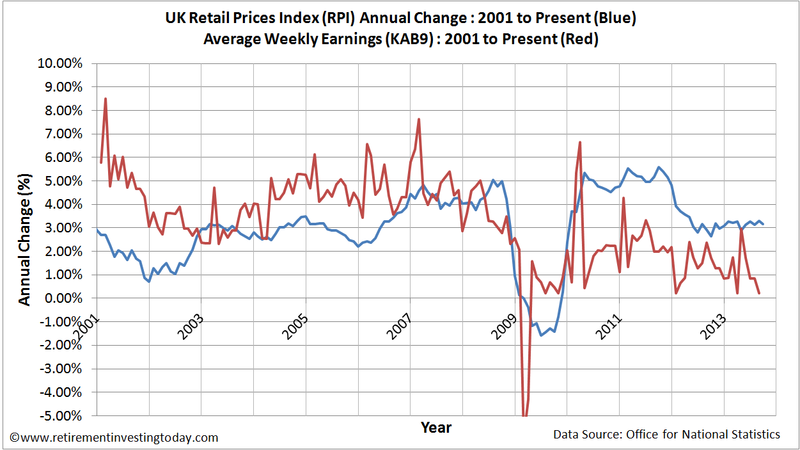 Back in 2007 I decided that adjustment would be the Retail Prices Index (RPI). The chart below tells me that my retirement “annual pay” is increasing at a much greater rate than the average punter out there but for me the model seems to be realistic as my retirement date has hardly moved since 2007. When I started the blog in November 2009 I predicted 7 years until retirement (work becomes optional) and today I’m predicting that the day will appear some 2.5 years putting me ahead of the game at this time. The asset allocation model that I run using the Age in Bonds () Rule of Thumb. This rule says that you effectively have only 2 asset classes – “equities” and “bonds”. You then aim to hold your age in bonds with the remainder in equities. To maintain this rule it means that every year you need to move 1% of your total wealth allocation from “equities” to “bonds”. Within my portfolio I call my UK Equities, Australia Equities, International Equities, Gold (Commodities) and half of my Property - “equities”. I call my NS&I Index Linked Savings Certificates (ILSC’s), Index Linked Gilts, Emergency Fund (cash) and the other Property half – “bonds”. I also deviate from the rule of thumb a little as my rule is to use my Age in Bonds minus 10 for my “bonds” allocation. If I did nothing else this would imply I’m potentially carrying more portfolio risk than the rule of thumb as history suggests “equities” are more risky than “bonds”. However I add a little spice into it by working on the principle that I get some additional risk reduction from my Cyclically Adjusted PE Ratio (CAPE) work which might provide some protection against equity price falls coming from overvaluation extremes. So I need to remove 1% from the “equities” portion and add it to “bonds” portion, which will be index linked gilts given no ILSC’s are currently on offer. The original strategy required 0.5% to be taken from both the UK and Australian Equities allocations respectively. The original strategy also had me potentially retiring to Australia, thus the large Australian Equities portion, as a hedge against currency. Having now had the opportunity to spend quality time there in recent years, I no longer have that within my plan. Instead I now have Europe fully on my mind, which might include the wonderful UK, possibly Malta or some other as yet not defined Continental European location. TBH once work becomes optional I can easily see myself spending a good length of time in a few countries to fully understand the culture, people and true lifestyle before choosing a winner. I have plenty of time to formulate that plan. With that being the current plan I will now reduce my Australian Equities Allocation by the full 1% annually. Not taking responsibility for my actions and just acting like every other man or woman on the street. Waking up to the fact that I was being fleeced by the financial sector and was going to be “poor” in retirement followed by a DIY learning phase including a few mistakes. Progress to the new plan. So, how is your portfolio performing? YTD? A full analysis of YTD performance was included in the 9 month review. In short between the 05 January and 05 October 2013 (I record values weekly rather than yearly causing the odd dates) the portfolio is up 5.3% for a CAGR of 7.1%. In comparison the benchmark is up 7.0%. Since 2007 I'm well ahead of the benchmark but YTD I've lost a bit of that gain. How is your portfolio doing in comparison? around 11%, but my portfolio is somewhat aggressive and equity only. Just finished my yearly re-balancing. I would just like to pick up on the equity/bond ratio. At such a young age, I would seriously question allocating over 40% of your portfolio to bonds. As we all know, life expectancy is rising and you could easily be investing for another 50 yrs. I would suggest over such a time-frame equities are far more likely to provide better returns and the rising dividends will keep pace with inflation. I know you are a big fan of Tim Hale and I think he suggests investing 4% in equities for each year you intend to be investing. Obviously you have a plan and you may well be happy with the allocation but maybe just something to reflect on? Good to hear from you. Just to clarify, as detailed in the post, I am actually running an Age in Bonds - 10 strategy meaning today my target "Bonds" allocation is actually 32%. That said your thoughts are still very valid. At this stage, at least until work becomes optional, my very high savings rate and short duration mean I need to preserve wealth rather than maximise the benefits of compound interest. To demonstrate my current plan over the next 3 years, by which time I should be financially independent, has 67% of my wealth actually coming from savings and only 33% from investment return (in today's £'s). - I stay working (I'm still young), work part time or generate less salary through my own interests. All no problem as these earnings supplement the earnings from my wealth. I can stay low risk. - I stop earning altogether. This is very unlikely but let's talk about it. Let's say I stop derisking the portfolio at 60% equities:40% bonds. Using Hale's numbers, over the long term, this should produce a real return of about 5.3% less expenses and fees (my plan is based on 4.1%). Over the next few years bonds and equities - especially HY equities - are both likely to fall, as monetary policy becomes less lax. Gold may not be a beneficiary. Cash will benefit. How would that affect your outcome? My guess is that every time a government/central bank - especially the US - tries a wee bit of tapering, it'll take fright at the consequences and reverse its decision. At some time, perhaps remote, the attempt to avoid deflation will overshoot and we'll eventually.get high inflation, but presumably not hyperinflation (at least not, I hope, here). I look open gold as an insurance against … oh, against nasties of all sorts, guessable and unguessable, associated with fiat currencies. do you plan to make any adjustments for this new market crash coming?